Tan Sri Mohd Irwan Serigar Abdullah, Secretary General of Ministry of Finance and Chairman of Malaysian Global Innovation and Creativity Centre (MaGIC), launched the Sunway Innovation Labs (Sunway iLabs) yesterday at Menara Sunway, Sunway City,with Tan Sri Dr Jeffrey Cheah AO, Founder and Chairman of Sunway Group, and Chancellor of Sunway University. Tan Sri Mohd Irwan Serigar Abdullah, Secretary General of Ministry of Finance and Chairman of Malaysian Global Innovation and Creativity Centre (MaGIC) officiating the launch of the Sunway Innovation Labs. Looking on are Tan Sri Jeffrey Cheah AO, Dr Elizabeth Lee, Matt van Leeuwen, Dr Lee Weng Keng, Professor Graeme Wilkinson and Evan Cheah. Sunway iLabs will function as a start-up incubator as well as runaccelerator programmes,act as a micro ecosystem in encouraging development of the start-up ecosystem within the country.The unique not-for-profit smart partnership concept will see Sunway University, Sunway Group, and Sunway Ventures working together in a triple helix innovation model, which combines the strengths of stakeholders across academia, industry and government within a collaborative space. Their aim is to foster entrepreneurship and stimulate market-driven innovations enabling entrepreneurs to scale their business faster. At the Sunway iLabs, students from Sunway University will be able to apply their talent and technical expertise to growth-hack Sunway Group’s 12 business units. Sunway Ventures, the venture arm of Sunway Group which was set-up last year to drive the organisation’s future growth will fund viable startups that are synergistic to Sunway’s businesses. Sunway iLabs will also sync with the wider start-up ecosystem in Malaysia and abroad through collaborations and strategic partnerships to enable entrepreneurs to scale their business. Sunway iLabs has already established links with government bodies such as the Malaysian government agency responsible for overseeing MSC Malaysia implementation, MDeC; Agensi Inovasi Malaysia (AIM)-owned national technology commercialisation platform in collaboration with SME Corporation Malaysia, Platcom Ventures; Malaysian Global Innovation and Creativity Centre (MaGIC), Cradle Fund Sdn Bhd (Cradle) and its official trade association and governing body for Angel Investors and Angel Clubs in Malaysia, Malaysian Angel Business Network. In addition, Sunway iLabs has also partnered ride-hailing giant, Grab, and Silicon Valley-based entrepreneur camp designers, Young Outliers. 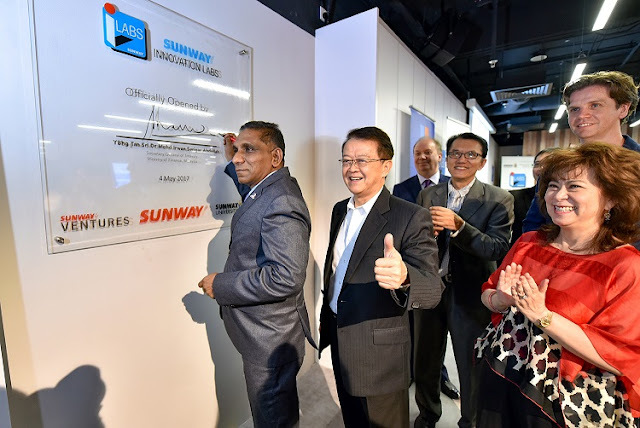 “The fact that Sunway's iLabs is set-up as a non-profit entity demonstrates Sunway's generosity and commitment to the national interest, particularly our drive towards being a top 20 country as outlined in the TN50. MaGIC is pleased to have Sunway iLabs as a partner," commented Tan Sri Mohd Irwan Serigar Abdullah. Tan Sri Dr Jeffrey Cheah AO said that Sunway Group had created Sunway Ventures as its corporate venture capital arm to invest and drive Sunway’s competitiveness in the digital space for the decades ahead. “iLabs marks the first joint initiative undertaken by Sunway Ventures and Sunway University. It will drive Sunway’s growth for the decades ahead and identify sunrise industries for us to invest in. It is a novel project that is aligned with the Government's stated goal of making Malaysia the start-up hub of the region. This non-for-profit iLabs will bring together the collective talents, financial muscle and deep experience of Sunway University, Sunway Group, and Sunway Ventures in to a single collaborative space to foster entrepreneurship and stimulate market-driven innovations,” said Tan Sri Jeffrey Cheah. The launch also saw three Memorandums of Understanding (MoUs) exchanges. Grab Malaysia was represented by its Country Head, Sean Goh; MaGIC by CEO, Ashran Dato’ Ghazi; Young Outliers by Co-Founder and CEO, Steve Hsia; Sunway Ventures CEO, Evan Cheah; and Sunway University and Sunway Education Group was represented by CEO, Dr Lee Weng Keng. The first MoU between Sunway University and Grab, will see the Group and the ride-hailing platform working together in areas that will benefit Sunway University students and alumni, promote technology and innovation, and improve social mobility. The agreement between Sunway Ventures and MaGIC will be a joined study for potential avenues of collaboration between Sunway and MaGIC in MaGIC’s programmes in Malaysia to support and develop startups or entrepreneurs who are in line with the strategic goals of Sunway while building a healthy micro-ecosystem for the sector. The collaboration between Sunway Education Group and Young Outliers will create a cooperative framework which will see the management team from Young Outliers deliver talks, mentor and attend knowledge sharing sessions (online or offline) for the Sunway Innovation Labs, and through bootcamps, accelerators, innovation challenges, and business idea or pitching competitions. Among those in attendance at the launch were Dato’ Chew Chee Kin, President of Sunway Group; Professor Graeme Wilkinson, Vice-Chancellor, Sunway University; Dr Elizabeth Lee, Senior Executive Director, Sunway Education Group and Sunway University; Tan Sri Datuk Seri Razman M. Hashim, Tan Sri Dato' (Dr) Ramon. V. Navaratnam and Professor Tan Sri Dato' Lin See-Yan, Pro Chancellors of Sunway University and Matt van Leeuwen, Director of Innovation and Commercialisation, Sunway University. Prior to the launch, panel sessions featuring 20 speakers from academia, venture capital firms, and successful start-ups as well as government agencies were conducted for over 300 students and young entrepreneurs. Speakers include Dato’ Yasmin Mahmood, CEO, Malaysia Digital Economy Corporation (MDEC); Steve Hsia, Co-Founder and CEO, Silicon Valley-based Young Outliers’ and Chris Burry, Co-CEO, US Market Access Center (USMAC).